This handout is designed to give you an overview of some of the internal parasites that can infect your dog. There are also separate information sheets on roundworms, hookworms, whipworms, tapeworms and heartworms that will provide you with more details. There are several types of internal parasites that cause problems in dogs. These include nematodes or roundworms, of which Toxocara canis (intestinal roundworm) and Dirofilaria immitis (heartworm) are the main examples, and cestodes or tapeworms of which Dipylidium caninum, Taenia species and Echinococcus species are important examples.Ancylostoma species (hookworms) are also common internal parasites in many parts of the United States. What will happen if my dog gets worms? If a growing puppy is infected with a large number of roundworms, the worms can stunt the puppy's growth, cause serious digestive upsets and result in excessive gas formation. These puppies have a characteristic 'pot bellied' appearance. Nematodes (roundworms) are free-living in the intestines. Roundworms do not require an intermediate host to spread from dog to dog, but can be transmitted from dog to dog via infective eggs shed in the feces. Hookworms, particularly Ancylostoma, are one of the most pathogenic intestinal parasites of the dog. The hookworm is approximately ½ to 1" (1-2 cm) long and attaches to the lining of the small intestines, where they feed on blood. As a result of blood sucking, hookworms can cause severe anemia. The infective larvae can enter the host either by mouth or through the skin, particularly the feet. Eczema and secondary bacterial infection can result due to irritation as they burrow through the skin. Whipworms are small worms, usually only ¼" (6 mm) long, that live in the large intestine, where they cause irritation and inflammation. Symptoms of whipworm infection include chronic watery diarrhea, bloody diarrhea, and weight loss. In order to get tapeworms, an intermediate host, the flea or certain species of rodent is required. 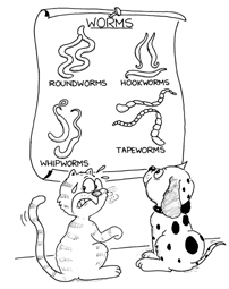 In other words, your dog cannot get tapeworms directly from another dog or a cat. Dipylidium caninum, the most common tapeworm of the dog, causes few problems in the adult host but can result in digestive upsets and stunting of growth in puppies. The intermediate host of Dipylidium is the flea. Taenia species of tapeworms usually infect adult dogs and cause few problems. Puppies are occasionally infected and, depending on the type of worm involved, the large number of worms can cause intestinal blockage. The intermediate host for Taenia species is small mammals such as rodents or rabbits. Echinococcus, another type of tapeworm, is important because it is zoonotic, meaning humans can be infected. The adult tapeworm is tiny, only about ¼" (5-6 mm) long. Sheep and sometimes man can act as the intermediate hosts in which the immature forms of Echinococcus develop inside hyadatic cysts in various organs. In man, these cysts can involve the lungs or brain.